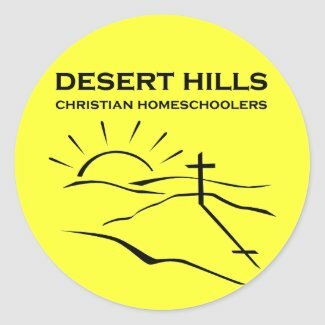 The "official" shirt for our homeschool group is this yellow tee! 100% cotton with a loose classic fit that wears well on anyone. 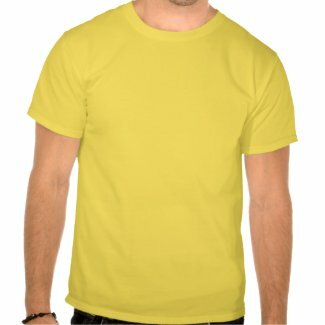 Matching t-shirts provide a sense of group identity - plus, the color yellow is easy to spot - in the desert, in the woods, or in a crowd! It would be nice if we can all get the same color shirts so we can quickly locate and keep track of our group members on field trips, service projects, etc. But if you prefer something else, feel free to pick and choose. They will all have the same design on front. For every order placed, 10% of the sale will be donated to DHCH. If you click through the links on this page, we will also get a 7% referral fee - that's 17% in total earnings! We can use this money for group activities, special events, speaker honorariums, etc. If you type the URL into your browser, don't forget to add the asterisk. * This is called the "Zazzle Star" and it functions as our referral link. Great on field trips and outdoor events for keeping the sun off your head! Wear it with or without the matching t-shirt. 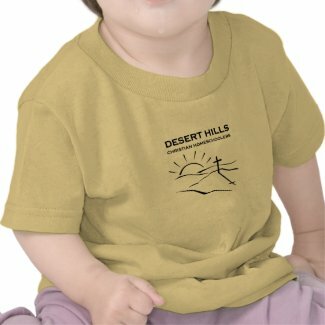 DHCH t-shirts in kids and adult sizes. 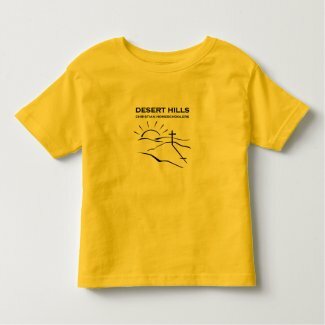 DHCH t-shirt sized just right for toddlers. DHCH t-shirt on a smaller scale for babies. 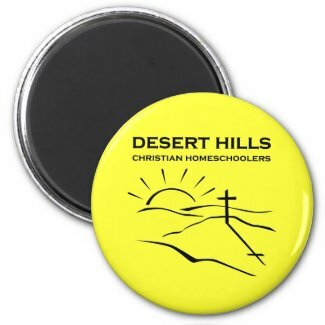 A button with our homeschool group name on it that can be pinned to your bookbag, backpack, tote bag, purse, fanny pack, lapel, etc. If you don't have a DHCH t-shirt, you can wear this button and we'll still be able to spot you! 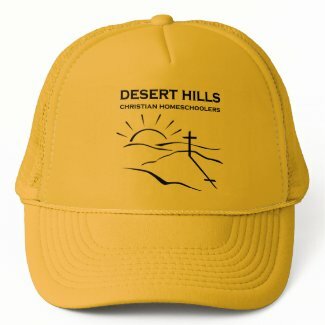 You can put these large round yellow stickers on notebooks, folders, binders, in scrapbooks, and on the front of your DHCH Membership Booklet after you print it out. for holding notes, lists, reminders, assignments, kids' artwork, etc. Keep your mouse rolling in style on a DHCH mousepad. 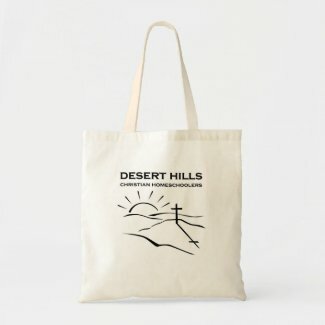 Use this tote to carry your books and supplies. Or bring it to the homeschool convention and fill it up! Copyright . 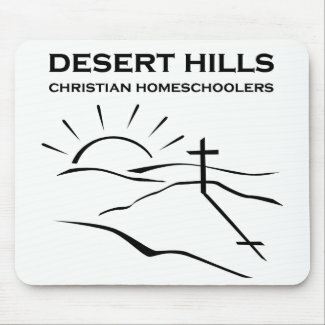 Desert Hills Christian Homeschoolers. All rights reserved.